Sonar’s Skylight interface is largely unchanged. Maybe it’s the weird weather that’s driven developers into full gear, but this winter has certainly been the season for major updates. 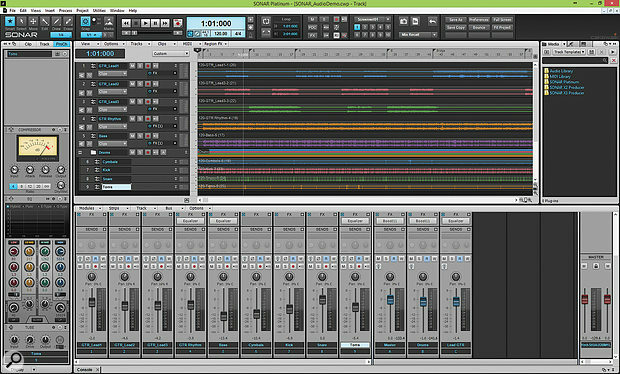 Both Propellerhead and Steinberg got in their version 8s before the end of the year, while Cakewalk chose to unleash the latest iteration of their Sonar DAW in the build up to NAMM 2015. Sonar Platinum, as it’s now called, is the first major DAW to step away from traditional ideas about purchasing and support, pre–empting Avid’s similar move with Pro Tools 12 by a couple of weeks. What’s loosely been termed the Adobe model (as Adobe were the first big company to switch to it) replaces the traditional boxed, fixed–fee purchase with a subscription of monthly payments. While you continue to subscribe, you receive support and free access to any updates that occur during your subscription. Cakewalk have put their own spin on this, by insisting that users are buying ‘membership’ rather than a subscription, and by offering additional custom content to members each month. And after 12 payments, the software is yours to keep using; alternatively, you can continue to subscribe to keep the support, updates and content flowing. They also stress that they still offer the traditional boxed product, which includes 12 months of free updates and content. Any future updates would require the renewal of membership at some kind of upgrade price. So in many ways it’s the same deal as before, but you are buying on credit so you don’t have to fork out a large sum up–front. Whether this model works for you or not, it does seem to be the future. Cakewalk have introduced a new software and installation manager called the Command Center. 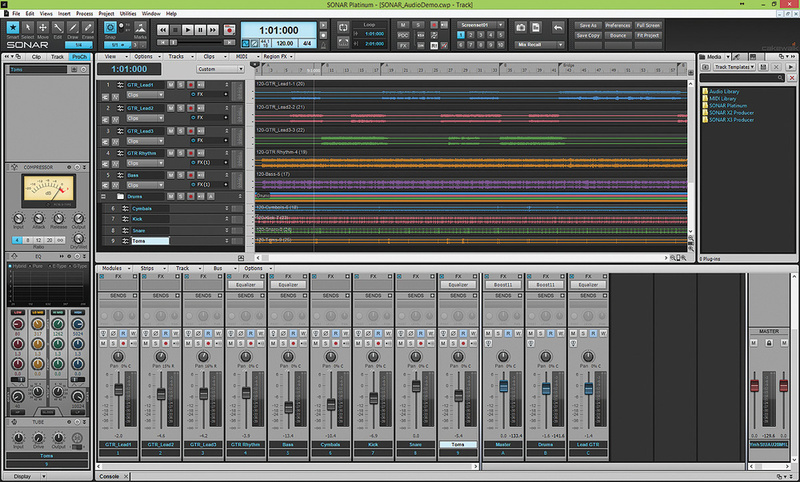 Cakewalk’s Command Center downloads, installs and updates your software. It lists the Cakewalk products you own and their serial numbers, and will perform a complete, automatic download and installation for you. If you have a non–urban Internet connection like mine, this might take a very long time! Before you do anything, though, click on the Settings button and make sure the destination folders for the downloads and plug–ins are correct; otherwise, you may find your system drive suddenly gets very full. There are, unfortunately, no options to specify destinations for library content, so you may need to do some shifting about once you get into Sonar. In my studio, the Command Center was able to chug on through a couple of broken Internet connections and one unrelated system crash, and by the next day I was ready to rock — or so I thought. It then decided I hadn’t installed everything after all, and gave it another go. The flagship Sonar Platinum includes XLN Audio’s Addictive Drums 2, with your choice of three add–on AD packs. This is accessed through another online installer where you enter your key from Cakewalk and can choose any three packs from a large and interesting selection. Three more bundled products — Celemony’s Melodyne and Cakewalk’s own Dimension Pro and Rapture — also require separate authorisation and registration. I can understand why this is necessary with Melodyne, but surely it’s time that Dimension and Rapture were baked into Sonar? An additional annoyance is that the Command Center doesn’t allow you to copy and paste serial numbers, so you have to enter them by hand. Although I’m sure the automatic installation of Sonar is helpful to many, I’d really much prefer to download a bunch of files and run them myself, particularly given how big everything is. Suffice to say it’s important to schedule yourself at least a day if you want a stress–free installation. It should be noted, though, that if you keep hold of the Cakewalk/Downloads folder you won’t need to download everything again if you need to reinstall or equip a second machine. On the first run, you’d be hard pressed to notice any difference from the previous version of Sonar, X3 (reviewed in SOS January 2014: www.soundonsound.com/sos/jan14/articles/cakewalk-sonar-0114.htm). The layout and styling is the same, the toolbars appear identical, the background scan of plug–ins is unchanged and the little Quick Start window pops up as friendly and inviting as it always does. This offers some handy resources, in the form of links to online tutorials and to a bunch of useful videos showcasing many of the new features. The latter are invaluable to all levels of experience, and I would recommend that even the most hardened user should give them a browse. You’ll also find the majority of the documentation online, and there’s lots of it to help you get to grips with Sonar. The depth is excellent, but the index seems to be missing some vital things. You won’t find Mix Recall under ‘M’, but under ‘C’ for Content Location; the Pattern Tool is under ‘Patches’; and VocalSync can only be found under ‘Vocal Track’. You can use the search box to do a Google–style search of the site and then use Sonar version filters to drill down to your particular version, but perhaps having entirely separate documentation for each version would be a little less overwhelming, as you’re never completely confident which versions of Sonar any given piece of documentation applies to. Having said that, I did find all the answers I searched for, which is all you can ask of a manual really. In most respects, the feel of the Skylight interface is unchanged, but on loading up the classic SONAR_AudioDemo.cwp project (time for a new demo song perhaps?) some of the subtle differences start to become clear. On the left of the toolbar, the ‘X3’ has dropped from the word ‘SONAR’, and on the far right, the Cakewalk logo is now present. In the toolbar itself there are two new modules, and the Sonar X3 Gobbler, which allowed integrated cloud backup, is missing. My understanding is that Gobbler no longer support the integrated API, but Gobbler users can continue using their account directly in a non–integrated fashion. The two new modules are a customisable panel into which you can place shortcuts to any menu item or command from an enormous list, and the Mix Recall panel, which we’ll come onto in a moment. When you right–click in the toolbar you now have many more customisation options such as changing the size, collapsing modules into tabs, and various docking options. The Sonar toolbars can be mind–boggling, so the ease with which you can arrange and view/hide various panels is very welcome. The Custom module allows you to create a shortcut button to any menu item or command. Sonar’s Mix Console has enjoyed some subtle but welcome improvements. It has always been configurable to suit different ways of working: personally, I don’t like using the Sonar mixer in docked mode, as it always feels like I can’t quite see all of it. You get duplication on the left in the inspector panel, which is also out of line with the rest of the console, and the buses and masters are fiercely segregated. So it’s only when I release the console from the dock and float it onto another screen that I begin to feel comfortable with it — but there are, as before, plenty of alternatives. You can either adjust the dividers in docked mode to reveal which part of the GUI you want to see, or you can use Screensets to flick between different views. 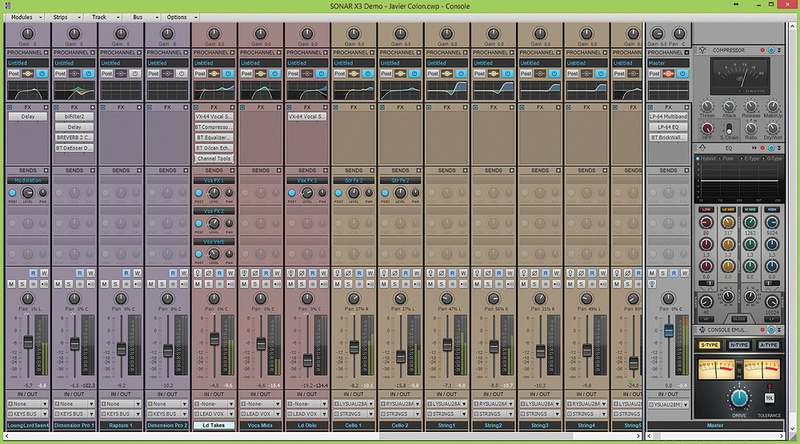 You can also simply float the Console on top or full screen in a Pro Tools style. However, one longstanding Console limitation concerned the FX ‘bins’: black squares that would show a maximum of three effects. These have now been replaced with an FX stack that continually expands as you add plug–ins, so there’s no longer a need to use tiny arrows to scroll up and down to see what’s inserted. The sends are likewise released from their single display, letting you stack up as many as you like in plain view. The layout of the sends has been polished, and the look of both Send and FX stacks is very pleasing, and feels a lot more consistent than in the previous version. The newly tweaked Console view now allows for stacked effects and sends. The Console’s killer function is still the series of integrated channel effects known as the Pro Channel. This remains unchanged and slightly hidden away, though if you hold Ctrl and click on the show/hide button, every channel’s Pro Channel reveals itself. The available modules are the same as in Sonar X3, but for one important addition: Rematrix Solo is a single–layer version of Overloud’s multi–layer convolution reverb (the full version of which was reviewed in SOS December 2014: www.soundonsound.com/sos/dec14/articles/rematrix.htm). 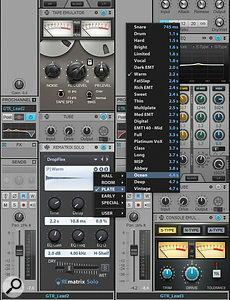 It comes with 100 impulse responses designed by MoReVoX, as well as letting you add your own WAV or AIFF impulse files. Within each preset, you have information on the type of reverb and the response time, and you have control over the time, decay and stereo spread along with some EQ. 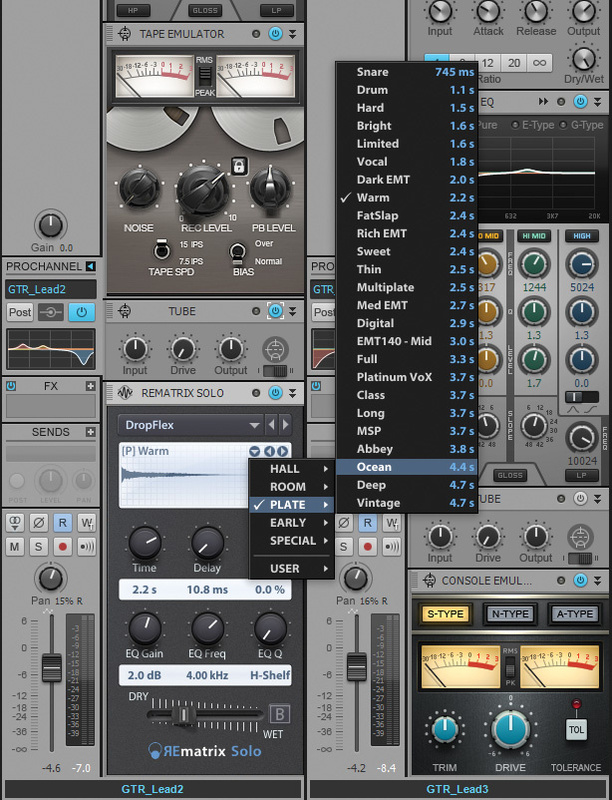 It’s a decent reverb with simple and yet satisfying controls, but this single–layer version loses the unique selling point of the multi–layered Rematrix. Without the full version’s ability to mix and match impulses, not to mention its drive and compression effects, you’re left with a fairly bog–standard convolution reverb, albeit a very welcome one. The new Rematrix reverb module sitting in the Pro Channel. There’s a growing library of third–party Pro Channel modules available for both the Professional and Platinum versions of Sonar, including plug–ins from developers such as Softube and Boz Digital Labs. I hope Cakewalk continue to push and develop this format, because it’s a unique approach that works brilliantly. Compared with the frustration of trying to work with a cascade of different–sized plug–in windows, the Pro Channel is a godsend, giving you an instantly accessible overview of what’s going on in a very familiar form. It’s a bit like the software equivalent of 500–series modules, where the constraints of the form factor bring a certain amount of simplicity and standardisation — which, when mixing, is no bad thing. Since X3, Sonar has supported the ARA (Audio Random Access) extension of the VST format which allows it to more closely integrate a compatible VST 3 plug–in. In X3 this allowed Melodyne to be directed to individual audio regions rather than floating around as a rather cumbersome plug–in. 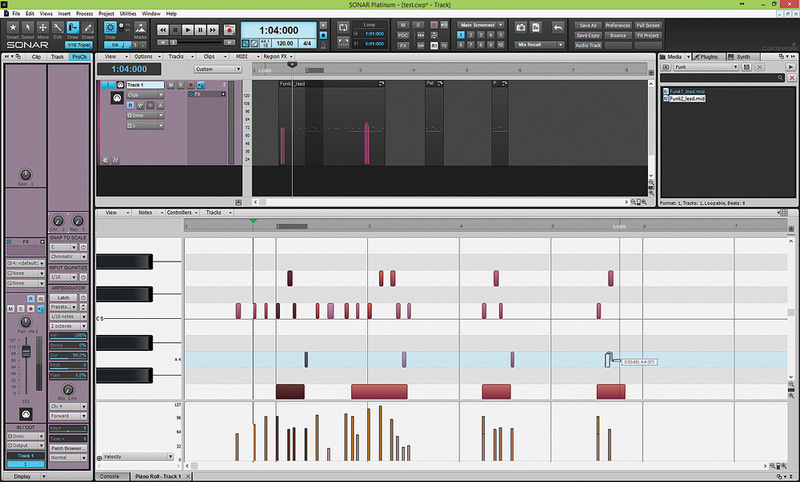 Cakewalk’s new VocalSync technology works in the same way. It does exactly what it says on the tin: syncs up your vocals. So, if you are overdubbing or recording multiple takes, you can use one performance to be the guide track for all those others. Select the region that you want to modify and choose VocalSync from the Region FX menu. You then select the name of the guide track — the performance you are sync’ing to — and after a moment’s analysis, your region is transformed into a graphical fusion of the two tracks. The top half is the performance you are sync’ing, and the bottom half is the guide track. The only control is a Strength knob, which dictates the amount of change or closeness of sync. All the way to the left and it’s essentially bypassed, while turning it all the way to the right forces the two performances into total alignment. 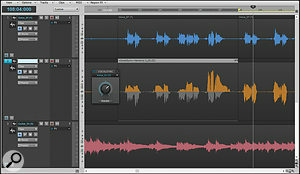 VocalSync does more than simply cut up audio and move it about. It analyses and compares the onsets and decays of the guide and overdub and then uses time–stretching and compression to bring the waveforms into line. You can see the time manipulation going on if you change the edit filter to show Audio Transients, and it’s clearly being very clever indeed. The excellent VocalSync at work bringing some harmonies into line with the lead vocal. The results are excellent. I tried it with some harmonies that sounded a little bit flabby even after a lot of visual aligning, and with VocalSync engaged they sound completely tight and on the money. As with all time–stretching you can get artifacts if you push it too far, and sometimes you need to cut your regions down to size so that you’re dealing with smaller segments, so you can apply more or less Strength to different sections. Once you start experimenting with different guide tracks, you can very quickly find yourself destroying the nuances of the vocalist’s performance in the desire to get the vocals to sync with the guitars! VocalSync has two levels of processing. It uses a simpler algorithm for live auditioning, and a more complex one for the render. It’s designed to be rendered onto the track rather than left floating and I found that most of the slight artifacts had vanished once I’d done so. There are many other things you can do with VocalSync: ADR lip–sync to picture, synchronising machine drums to live drums, or vice versa, and tightening up instrumental tracks. The documentation suggests you can use it to change the gender of the voice, but I can’t for the life of me work out how it would do that, and think perhaps it’s a copy/paste error from the Melodyne documentation. But anyway, provided the guide and overdub share the same sort of timing, then VocalSync can produce flawless results, and even outside those parameters, there’s lots of scope for re–grooving, effecting and destroying. When you want to experiment with different mixes of the same project, you’d normally use the Save As... function to create duplicate copies of the project. This can often leave you with a confusing trail of project names, and means having to reload an entire project to load an alternative mix. 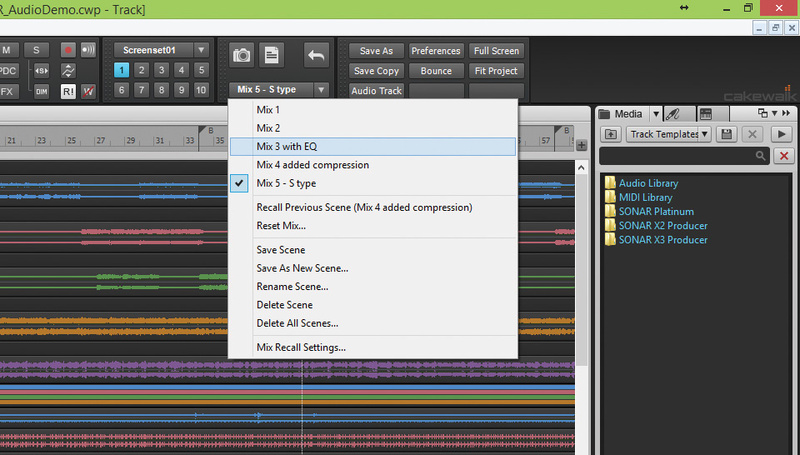 Sonar’s new Mix Recall feature allows you to save and recall multiple mixes within the one project. It’s like taking a snapshot of the entire mix, complete with plug–in and automation data, so you can return to it at a later date if the road you’re going down doesn’t work out. Mix Recall is accessed from a module in the toolbar. There’s a button with a camera on it that saves the current ‘scene’, a button with a page on it to save as a new scene, and a back arrow button to switch between the last two scenes. That’s a really good feature for instantly A/B–ing small changes. Underneath it is a drop–down list of all your mixes. Save and recall mixes at the touch of a button. 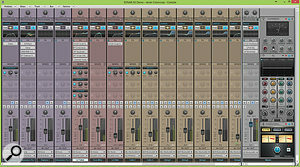 A Mix Scene contains all the Console and Pro Channel information, all track automation and settings, all plug–in information, MIDI CC parameters and arpeggiator controls. However, you don’t have to recall an entire mix: you can opt to recall just selected tracks, through the use of a switch in the advanced settings. No regions or clips are moved or recalled, nor Region FX like VocalSync and Melodyne. I’m terrible at managing my projects and tend to rely on a comprehensive undo strategy as I go bounding off at tangents, so it’s an awesome ability to be able to quickly save where I am and then save a new scene, safe in the knowledge that after I’ve experimented I can return without interrupting the flow by having to find and reload whole projects. One last Mix Recall goodie is that you can opt to export all of the scenes in one Export Audio action — nice. 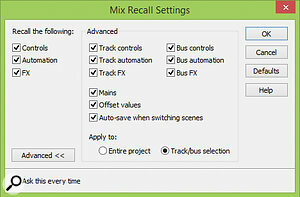 The advanced setting available in Mix Recall. It should be noted, though, that it’s very easy to hit the camera button and accidentally save a scene over the one you’re working on when you meant to create a new scene — there’s no scene history and no undo, and in fact, every time you recall a mix you also lose your general undo history. Maybe a tweak to this module could be an automatic version creator within the one scene, so that every time the camera button is pressed you don’t lose what was there before. Cakewalk quietly snuck multi–touch support into Sonar with the X2a update back in December 2012, and they’ve remained pretty much the only major DAW makers to do so. Multi–touch is the ability for more than a single action to be carried out at one time through a multi–point touchscreen. With a mouse, by contrast, you can move one parameter or item at a time; and in non–multi–touch applications, you can usually use a finger to do the same, assuming you have a touchscreen. Multi–touch support enables you to move two, three or more controls simultaneously, depending how many fingers you have and how many touches your screen supports. The take–up of desktop multi–touch has been slow, although the market penetration of hybrid laptops and all–in–one desktops with touchscreens is starting to make an impact, and with Windows 10 around the corner, maybe Cakewalk’s investment and innovation will start to pay off. We didn’t have a touchscreen to hand when we reviewed Sonar X3 last year and so although little has changed with Platinum we thought it would be worthwhile getting our fingers dirty this time around. There are three main areas of implementation: the Console view, the Skylight interface and the Matrix. Let’s start with the most immediately satisfying, the Console. A mixer perfectly lends itself to multi–touch. It’s the one place where moving more than one thing at a time is the most natural thing to want to do. Most touchscreens are able to lie flat or at a slight angle, mimicking the form factor of a hardware mixer and minimising the strain on your limbs. You can then simply grab a bunch of faders with your fingertips and move them all about to your heart’s content. The entire channel strip is wired for multi–touch, so while you’re adjusting a fader you can also be adjusting the pan, sends, gain and EQ. The feel of interacting with the mixer in this way is different to both using a mouse and using a hardware controller. With those external peripherals you tend to be sat back, watching from a distance. With a multi–touch screen you tend to find yourself pulled into the software, engaged directly with it. It has an immersive feel that I’ve not encountered in 20 years of using computer–based music production software. It’s very pleasing. In comparison to hardware, the ergonomics are very different, and trying to move eight virtual faders with your fingertips in a kind of claw–like fashion is very awkward, but that’s probably not something you’d do very often even with hardware. Once you’re drawn into touching stuff, you find yourself reaching out to touch everything. Even using single touches, you have the same control as with a mouse, yet with the deeper connection of direct knob control. Of course there’s no tactile feedback, but visually and emotionally it’s very interesting indeed. The other side of the Console is the Pro Channel, and this also benefits from multi–touch, particularly the QuadCurve Equalizer. One of the drawbacks with touch is that not all GUIs lend themselves to manipulation by fat human fingers. With the QuadCurve EQ, Cakewalk brilliantly demonstrate how to provide the perfect touch interface, thanks to its fly–out panel. Double–tap on the small EQ display in the Pro Channel, and out slides a huge panel where you have complete fat–finger multi–touch control over all four EQ bands. This is the sort of implementation you need on all plug–in interfaces: the ability to make the controls bigger and more touch friendly. Sadly, though, Cakewalk haven’t extended this concept to any other part of the Pro Channel, or anywhere else for that matter — which is a shame, because some of the other multi–touch implementation in the ProChannel is lacking a little consistency. With a mouse, you click on any control and move forward and backwards to change the value. With a finger, controls in some of the modules behave the same way, but with others like the compressor, tube emulator and EQ, you have to use a side–to–side, arc–type movement following the turn of the knob. Why can’t it be consistent? There’s some other oddness too. When you are moving a fader with one finger, you can’t open the Pro Channel or toggle the mute/solo buttons on the same channel; you appear to select them but they don’t activate unless you take your finger off the fader first. You can, however, activate the same features on any other channel. The throw of the faders is also a little bit short, and more accurate control would be possible if they were twice as tall. If you’re working on a single, touch–enabled screen, then interacting with the rest of the Skylight interface becomes important, and Cakewalk have done a great job here. Normally one of the most annoying and difficult things to do with a finger is to move window separators. It invariably takes multiple attempts to touch just in the right place. In Sonar, somehow, this is a breeze, and I can’t seem to fail to move all the separators and resize the docked windows first time every time. That removes one large chunk of frustration that I often encounter when using other DAWs with a touchscreen. The modular toolbar is also very touch friendly, and the new ‘custom’ module where you can set up shortcuts to whatever control you wish really comes into its own here, allowing you to perform common actions without having to return to the mouse. In the Matrix view, you have multi–touch control over all the cells, so you can trigger a bunch of them with the tap of your fingers. You can drag and drop samples and MIDI loops, and play with the faders in the Inspector all at the same time. It works very naturally and becomes a simple, creative space. The one place where it gets a little weird is the Track view. You can move the loop points in the timeline, you can zoom beautifully either horizontally or vertically by using the pinch gesture — but that’s it. You can’t touch any of the clips, you can’t drag them or select them, you can’t use any of the tools, you can’t edit automation or draw in any parameters: none of the mouse actions can be performed with a finger. This is weird, because in any other DAW I’ve tried, you can manipulate everything in the track/project/session/arrange view with a single finger — and they’re not multi–touch enabled. One of the great things about touch, particularly if you’re using the digital pen on the Microsoft Surface Pro, is being able to draw automation data and envelopes, but sadly, this is not available in Sonar. This lack of touch support also extends to the piano–roll view. In a nutshell, Sonar allows you to enter into a touch environment when mixing, but as soon as you want to edit something, you have to drop back to a mouse and keyboard. Of course you should use whatever input device is appropriate to the task, and there’s nothing wrong in leaving the detailed editing to the more precise devices, but it can be a bit of a jolt moving from one type of control to another. Although I’m hard pressed to see any changes in the multi–touch implementation since its arrival in X2a, Cakewalk say that this is an area they are constantly improving and developing, and I’m very hopeful that there will be more great things to come. There are currently no other players amongst the major DAW companies, so Cakewalk have a big head–start in an increasingly touchy world. With the Pro Channel, VocalSync and Mix Recall, Cakewalk have created a seamlessly integrated audio production workflow that keeps you in the action and keeps you in that creative space. They appear to have worked hard on removing previous gripes about restrictions in the Console view, and continue to innovate in areas where you had assumed it’s all been thought of already. The multi–touch implementation is useful and unique, but feels unfinished and needs pushing into more areas. It remains to be seen how well the membership concept pans out, whether Cakewalk can maintain the flow of new content and updates and how the support evolves — but ultimately Sonar Platinum maintains its position in the Premier League of digital audio workstations. Much of the focus of recent Sonar versions has been on the audio production side, so it’s nice to see improvements in the realms of MIDI sequencing. 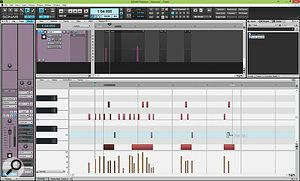 MIDI Time Stretching allows you to compress or expand a MIDI clip by holding Ctrl and dragging on the right edge. All the notes within the clip expand and contract relative to one another to allow you to align your MIDI clips to whatever timing or grid/no–grid you desire. You can go up to 400 percent in either direction, making this a very versatile function that you could only really mimic previously with tempo adjustments. The name of the new Pattern Tool suggests drum patterns or some kind of automatic player, but actually it’s much more interesting than that. 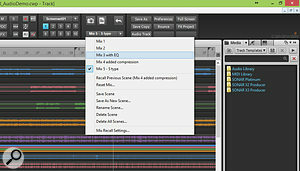 It allows you to select part of a MIDI clip and ‘paint’ that data elsewhere in the timeline. The results are similar to copying and pasting, or duplicating, but the process has a much more creative elegance. The Pattern tool brushes on the selected notes in the improved piano–roll view. It’s accessible from the toolbar and uses a paint roller as an icon. As you click and drag on the track, the selected notes appear, but not all at once as they would if you pasted them; instead, they get rolled on as you drag. If you keep going, it will loop as far as you like. You can also use the roller to paint MIDI data from a clip in the media bay — simply select the clip and roll it where you want it to be — so if you have a library of MIDI clips, loops or phrases, you can very quickly build up a track. Alternatively, you can start creating a library of clips by selecting parts of a MIDI file, rolling out the part you’re interested in and then dragging it to the Media Bay. That’s a way of doing things I’ve not seen before, and it really is very good. The piano–roll view has also been enhanced. Cakewalk have made the piano notes a bit chunkier so it’s easier to see individual notes, and improved the use of colour to help you identify the right velocity stems for overlapping notes. You can use the Pattern Tool here in exactly the same way, with the added bonus that you can hold the Shift key to change the root note of the pattern you’re painting. Sonar Platinum still includes all the old Sonitus plug–ins and Cakewalk instruments, just in case you want to load up a project from the last millennium. Although legacy support can be useful, it has the effect of making most of the plug–in content, with the exception of the Pro Channel modules, look and feel a little dated. The stalwarts of Dimension Pro and Rapture feel like old friends who could really do with a haircut and a change of clothes. So, surely, a sparkly new version should bring with it some nice new plug–ins? Well, not really, no. There is a bank of new virtual guitar amps, accessible only via the FX Chain system, which are excellent, so along with the existing TH2 plug–in, the guitarist should feel well catered for. The only other new content is the upgrade to version 2 of XLN Audio’s Addictive Drums, but that’s no small thing: Other than the upgrade to Addictive Drums 2, the instruments are all old favourites. Addictive Drums v1, as bundled with X3, was great but had been around for a while, while AD2 is a new and premium product in its own right. 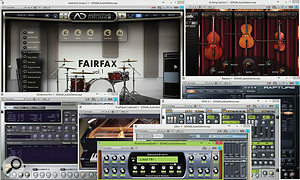 What’s more, Sonar buyers get to choose any three of the ADpacks, MIDIpaks and Kitpiece packs. Addictive Drums 2 is a world–class drum and percussion instrument that not only sounds fabulous but allows a lot of control over the sound and feel of all the fully customisable kits. Much more than just a sound source, it also has a fully tweakable beats and pattern section which can then be dragged as MIDI clips onto a MIDI track. It’s a very powerful piece of kit — but should we be expecting more than one significant inclusion in a major upgrade like this? Well, this does help to highlight the function of the Cakewalk membership. Cakewalk promise that any updates, or additional content, will be released as soon as it’s ready, rather than waiting for a new full release, and that new content will be released every month. According to the web site, three new features are in the works, called Drum Replacer, QuickFX and ‘Onscreen keyboard’, though no more detail is forthcoming than their names and a tantalisingly blurred image. So, ultimately, there should be a load more content coming, which is quite exciting, but out of the box it feels a little light. New purchasing options will make it more affordable for many. 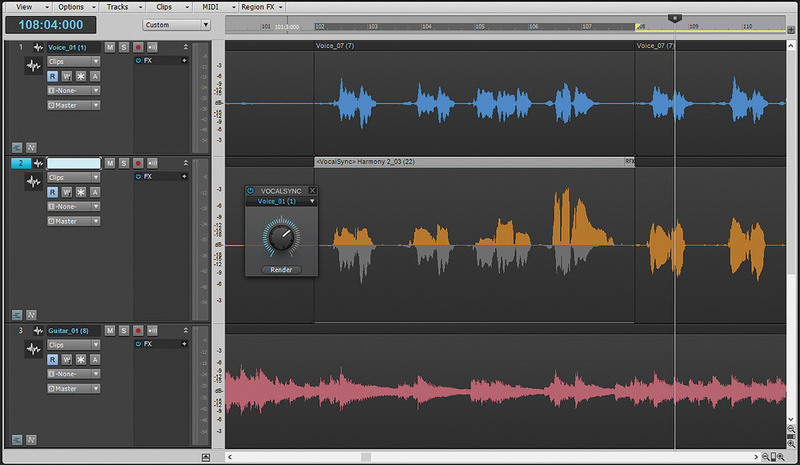 VocalSync takes the legwork out of tightening up backing vocals. Mix Recall lets you easily experiment with alternate mixes. Pattern Tool opens up creative MIDI possibilities. 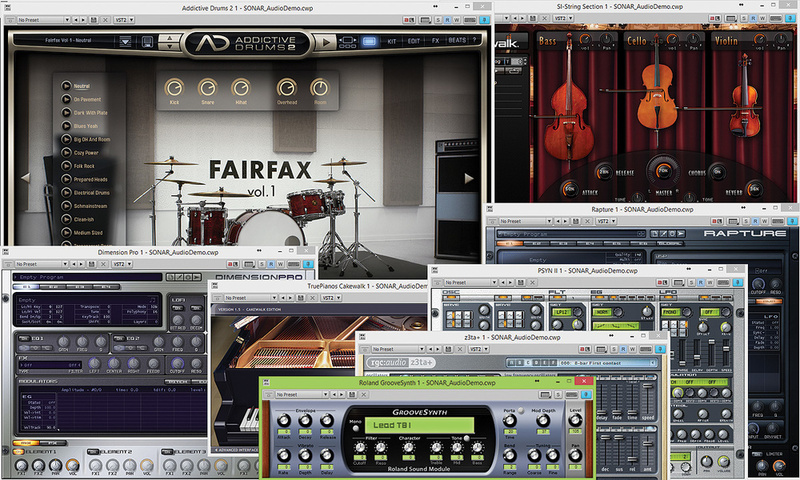 The only DAW with serious multi–touch support. 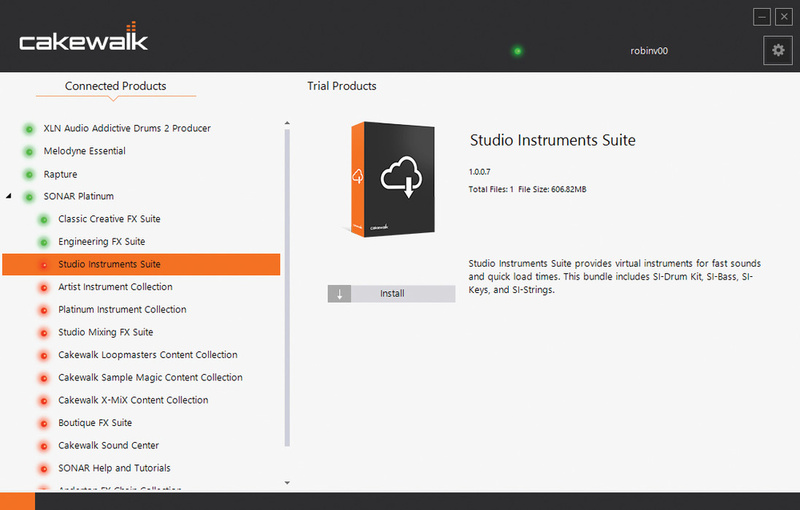 Includes the full version of Addictive Drums 2. Members will receive more new features and content every month. Dated plug–ins and old content. Rematrix Solo loses what makes Rematrix great. Lack of any ‘touch’ in track view and editors. Can get crowded on a single screen. Relatively little new content at this point. Cakewalk’s move to a ‘membership’ model means that enhancements and new content will be arriving little and often rather than being saved up for showpiece upgrades. However, there’s still plenty to admire in the new version. See ‘Platinum, Professional & Artist’ box for full details. See ‘Platinum, Professional And Artist’ box. Molten Music Technology Z97 Overdrive PC with Intel Core i7 4790K CPU and 16GB DDR3 RAM, running Windows 8.1, with Steinberg UR28M audio interface and Acer T232HL touchscreen. Microsoft Surface Pro 3 tablet PC.